﻿ Magazine content за Март 2019 г.
V.A. Belov What Is Foreseeability? In the past couple of years, Russian literature has been increasingly focused on whether to stipulate it in the Civil Code that damages can be recovered only for foreseeable losses. The author points to continued uncertainty surrounding the matter despite the scope and intensity of discussions. Going back and forth between objective and subjective sides of perception, in the heat of debate they tend to overlook the principle of moderation in essence multiplication. At the end of the day, the notion of foreseeability comes down to one of the old-standing and well-known categories in civil law: foreseeability is another type of reference for causation on the objective side and for culpability on the subjective side. The author’s final conclusion is that there is no need to amend because foreseeability has long been provided for in the Russian Civil Code. It is just a matter of correctly interpreting statutory provisions and thoroughly understanding their meaning. The author describes recent trends in adjudication of claims for damages in 2017 and 2018. 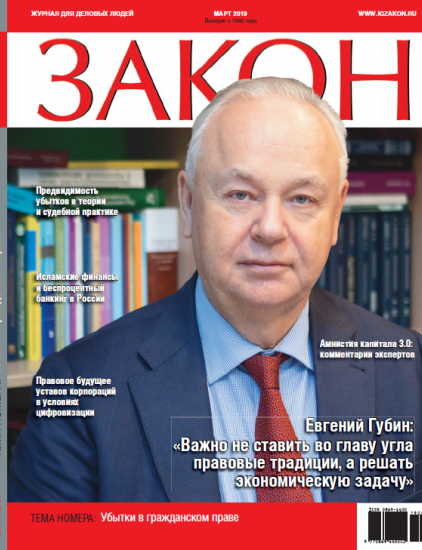 His analysis shows that the Supreme Court of the Russian Federation has admitted — with some reservation though — the recovery of pure economic loss and underlined the importance of expressly stating reasons for awards or dismissal when ordering the recovery of damages. This article outlines current approaches to recovering damages for contractual breach in Russia. It analyses the reasons that are being given by courts and provides examples that illustrate how theoretical principles can be used to validate the recovery of damages by the buyer in the value of liquidated damages received by third parties. The conclusion is reached that these cases need to be considered applying a set of principles such as foreseeability, causality and reasonableness of the creditor’s actions to reduce damage in addition to the well-established practice of evaluating whether the debtor is in a position to foresee the possibility of a loss. The work pertains to the problem of reimbursement of expenses that would have been incurred by the aggrieved person regardless of the damaging event. In particular, the article analyses the possibility of reimbursement of expenses incurred by the aggrieved person in the event of causing harm with purpose of minimising the amount of possible damages (preventive expenses) and the possibility of reimbursement of expenses associated with enjoyment of certain property (rent, insurance premiums, taxes etc.) which the aggrieved person continues to bear after impairment of such property without any possibility of using it (frustrated expenses). This article discusses some of the issues in establishing a causal relationship in cases on state liability. Courts sometimes refuse to compensate for damage caused by a public entity referring to the fact that the damage resulted not from officials’ wrongful acts but from other circumstances, such as the victim’s (contributory) negligence or actions by third parties. The analysis of the theory, case law and foreign practices with regard to the negligence of the victim and the plurality of causes allows victims to be prepared for possible barriers to substantiate causation in state liability cases, to take all possible measures, as well as to formulate a legal opinion to make their claims satisfied. The article contains an analysis of the main legal findings of the EAEU Court in 2017–2018. The case-law of the EAEU Court is examined from several angles: its influence on the application of EAEU law in the Union and the Member- States and from a comparative perspective taking EU law and the case-law of the CJEU as a point of reference. The Court’s judgments and advisory opinions addressed various issues pertaining to competition law, customs regulation, free movement of goods and workers, labour relations with the EAEU bodies’ employees and officials. Most notably, the Court has formulated the essential characteristics of EAEU law and provided a definition for the types of policies implemented by the Union. The establishment by the Court of the characteristics of EAEU law — such as primacy, direct effect and direct applicability — constitutes, according to the authors, a necessary precondition for its effective development and application, and paves the way for its use to protect the individuals’ rights and legitimate interests in the national legal systems. Nowadays the Islamic Development Bank pursues a consistent policy of expanding Islamic Banking outside the Islamic world (dar al-Islam). It aims at establishing the Islamic finance system based on religious principles and strengthening the economic influence of interest-free banks on the financial agenda including in non-Muslim jurisdictions. In this article the author considers ideological and legal principles of Islamic Banking and the core aspects revealing the nature of money as well as raises the issue of perspective formation of the interest-free banking in Russia. The complexity of the contract law implies conflicts of rules. Ancient principles ‘lex posterior derogat priori’ and ‘lex specialis derogat generali’ cannot solve all possible conflicts in modern multi-level and complex contract law. The complex system of contract law in Russia provides several levels of special rules, including not only Civil Code’s norms of the general part and on a specific contractual type, but also rules of complementary legislation and some norms of ‘public contract law’ (according to H. Collins), which means competition law rules, rules on standardisation etc. Those special rules provide a kind of conflict of laws when a rule on the legal status of a subject (i.e. a party to contractual obligation) states differently against a rule on the legal regime of an object. Three examples from the Russian Supreme Court’s jurisprudence on privatisation, public procurement, and consumer protection suggest that the rules on an object should have a priority. Several theoretical reasons can justify such a hypothesis: different political purposes of special rules, different legal nature of special rules, and the fact that the differentiation of objects is fundamental for the system of contracts in the Russian Civil Code, making new contractual types. The digitisation of the Russian economy has exacerbated the unresolved problem of statutory regulation of the ratio of legal provisions, statutes and corporate acts of legal entities, raising the question of the feasibility of preserving the traditional documentary registration of constituent documents, by virtue of the law incorporating the generally binding provisions of corporate law. Compliance with the established requirements substantially and without any reasonable expediency burdens both the business and the state apparatus that implements public competence in the field of state registration of legal entities, at the same time dilutes the value of the statute in the system of corporate acts. Challenges of time require a speedy development of standard charters of joint-stock companies in Russian law, the content of which would exclude duplication of legislation, showing the individuality of the corporate governance of a particular corporation. The experience of foreign countries in this matter is informative, but its study does not allow us to come to the conclusion that foreign developments are uncritically borrowed by the develo ping Russian corporate law. This article looks at the conflict of laws where a company’s transactions are challenged by the director who is a shareholder (participant) in the company. The author concludes that the director is obliged to reveal certain facts that have come to his/her knowledge. Otherwise, the challenge the director files can be construed as a statement of his/her lack of diligence. Such directors are not empowered to challenge the transactions they enter into in the capacity of the company’s management body. In addition, they may lose all powers when taking a stand against the company as the business entity will no longer be able to express its will. This paper is devoted to: 1) the question raised in 2004 by Federal Tax Service of Russia: “Who, in case of a change of senior management of a legal entity, should be the applicant when introducing the said alterations to the legal entity information contained in the Unified State Register of Legal Entities?”; 2) the answer which was given to the above question through the decisions of commercial courts, including the Supreme Arbitrazh Court of the Russian Federation; 3) the manner in which the reply was made, was understood and what results or consequences it has lead to; 4) the attempt to apprehend these consequences; and 5) the search for ways — if not to put an end to, but to tangibly complicate the vicious practice of entering into the Unified State Register of Legal Entities false information about the senior management of Russian companies (which existed, of course, before the events described therein, but it was largely simplified exactly as a result of them). The author’s proposals to change the current legislation are analysed by him (first of all) in order to find analogies and similar solutions among the existing corporate law norms in Russia, and (to a lesser extent) with references to the experience of foreign jurisdictions. The problem is elucidated using materials relating mainly to legal entities existing in the legal form of a limited liability company, which has a separate brief justification in this paper. This article is mainly focused on the legal issue of the claims decrease with respect to the entities controlling the debtor, and the claims of other creditors within the set priority. Based on a comparative legal analysis, the subordination and the recharacterisation are identified. These are features of the statutory regulation in the national law and foreign law as well as means of changing claims ranking. The result of the undertaken study is that the recharacterisation trend for claims of the entities controlling the debtor, which is emerging in domestic adjudication, largely contributes to the fair treatment of bankruptcy matters. At the same time, the law and order will be able to find a fully fledged solution to the legal issue of subordination of some claims to others, including but not limited to the claims which cannot be recharacterised as corporate ones, only in the course of further integrated development of bankruptcy law.